Appearance: Dark copper with thick legs. Nose: A faint hint of leather up front, like walking into a furniture showroom. Sweet black licorice, caramel, a bit of alcohol. On the palate: Full, voluptuous body. Like a porter on the palate. Lots of licorice, some more caramel and hard candy, maybe a little horehound. Finish: same notes as on the palate, but with some slightly bitter clove and Chinese five-spice. 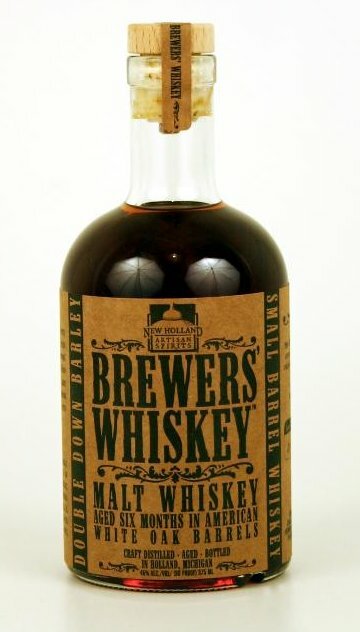 Parting words: This was the first entry into New Holland’s Brewer’s Whiskey series of small barrel, small bottle releases. Some of the acrid nastiness that very small barrels can throw into the nose is absent here. Instead, it’s like drinking a very spicy porter or sucking on black anise candy. A lovely whiskey, and one that is good sippin’ for the holidays. Highly Recommended.